Most people have the dream of having a toned, slim, tight body but for one reason or the other they do not like to or are not able to exercise. However, a little change in your lifestyle and a low carb diet program will take you closer to your dream. If you want to slim down without exercise, the low carb diet is your answer! Protein and fiber rich foods take a long time to be digested and give you the fuller feeling and thus, prevents craving. Vegetables and fruits are important sources of vitamins, minerals with a useful effect on blood lipids and blood-pressure levels. Also, a good enough sleeping will greatly increase your metabolic rate. Being in a caloric deficit for a long time can cause hunger feeling and intense sugar cravings. The best way to fight hunger and carving is to use appetite suppressants. 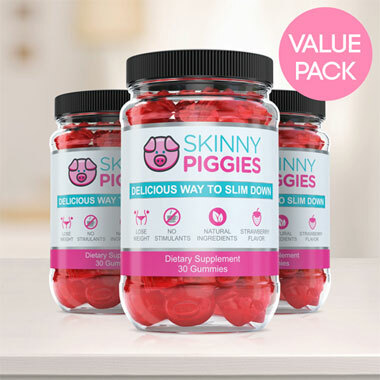 Skinny Piggies gummy appetite suppressing supplements help you control your hunger and feelings of satiety. Beat your hunger cravings, just take one gummy in between meals. Which is the Best Appetite Suppressant on the Market? Are Appetite Suppressant Pills Safe? Which Appetite Suppressant is Used to Treat Obesity? What Are Appetite Suppressant Pills? How to Use Fiber Gummies? Are Fiber Gummies Any Good? How do I Slim Down my Arms? What Fiber Supplements Are Best? Which Fiber Supplement Causes Less Gas? Which Fiber Supplement Tastes Best? Which Fiber Supplements is Best for Weight Loss? Why Is Slimming Gummies The Most Trending Thing Nowadays? Do you like eating tasty meals but also wish to lose weight? Burning fat is about creating a caloric deficit which means almost certainly you may be hungry often. Thankfully, now you can support your fat-loss by savoring a novel, all-natural diet gummy supplements, Skinny Piggies! 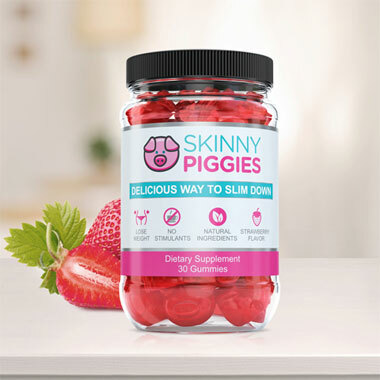 Skinny Piggies are amazing fruit flavored supplement fiber gummies that reduce sweet cravings and the desire for food while letting your body to remain in fat burning mode. Before we talk about what Skinny Piggies slimming gummies are, let's take a look what's needed for weight loss to occur. 1) A diet that's enjoyable, so that you will stick with it over time. Sadly, a large number of diet plans miss one-- or all three-- of the above items. To be able to see good success with your program, it's critical that you eat fewer calories than you burn daily. You could do that in one of two ways: boost your energy output through added physical activity or cut down your food consumption. Wait a second! This is great in theory, but try cutting calories and sweets cravings will set in, not to mention hunger that is hard to control. That's how Skinny Piggies gummies can help you. These fun & great tasting slimming gummies are formulated to not only help you stop the cravings but make it easier to follow your diet plan by making you feel full. The concept is quite straightforward. Appetite is regulated by 2 key things: the number of calories you eat and the feeling of food in your stomach. After a large meal, your stomach expands in size by the food pressing against the sides, that makes you feeling full and no longer hungry. When you start taking Skinny Piggies before eating lunch or dinner, you will feel fuller. Taking a Skinny Piggy with an 8oz glass of water 30 mins preceding eating dinner will cause it to expand in your stomach so that it takes up space and gives you the perception of having eaten a full meal. This way you can lessen the urge to eat and food cravings, hunger, and eat less, without feeling starving all day long. When you take these tasty slimming gummies before you eat lunch or dinner, it coat your food in a gentle gel, that slows down the movement of the sugar and carbohydrates you eat into the blood stream. This manages to keep the blood glucose stable and makes certain that your body stays in fat-burning mode for a long time. It may even help make your gym sessions much easier. 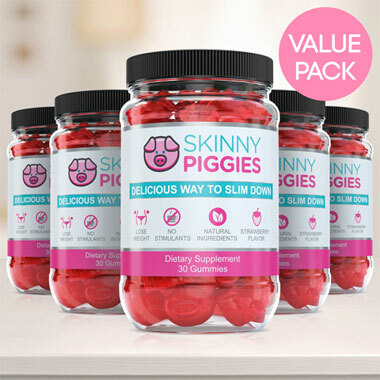 You may be thinking, what's special about Skinny Piggies versus some of the other fat loss natural pills sold online? First off, Skinny Piggies contains zero artificial additives. Take a look at your average fat burner and you'll see a whole line-up of chemicals. Skinny Piggies have zero artificial additives: you can pronounce all of the key ingredients. The wholesome, 100% natural ingredients used in Skinny Piggies also have added health-related benefits like support for powerful anti-aging properties, strong nails & hair, and glowing skin. Aside from that, they have absolutely no stimulants. That is a good point to know because if you consume stimulants, not only you will be struggling with burnout and lethargy down the road, but it limits when you can take them. Take a stimulant based fat burner too close to bed and you will not be getting any sleep. With Skinny Piggies, you can eat them day or night - no problem. There aren't any limitations with this product. Finally, what other fat loss product is as delicious as a strawberry gummy? 'Thought so. You'll really like snacking on these so forgetting to take your health supplement won't be a hindrance. They're simple to use and you can begin right away. Try one gummy Piggie and they will certainly become a highlight of your day. Weight loss results vary greatly depending on the individual's lifestyle, food intake, metabolism, physical activity, and genetics. We do not guarantee any specific results. This website does not provide medical advice. All information contained on this website is for educational purposes only. Always consult a qualified medical professional before beginning any weight loss, diet, or exercise program.